Now optimized for mobile devices. 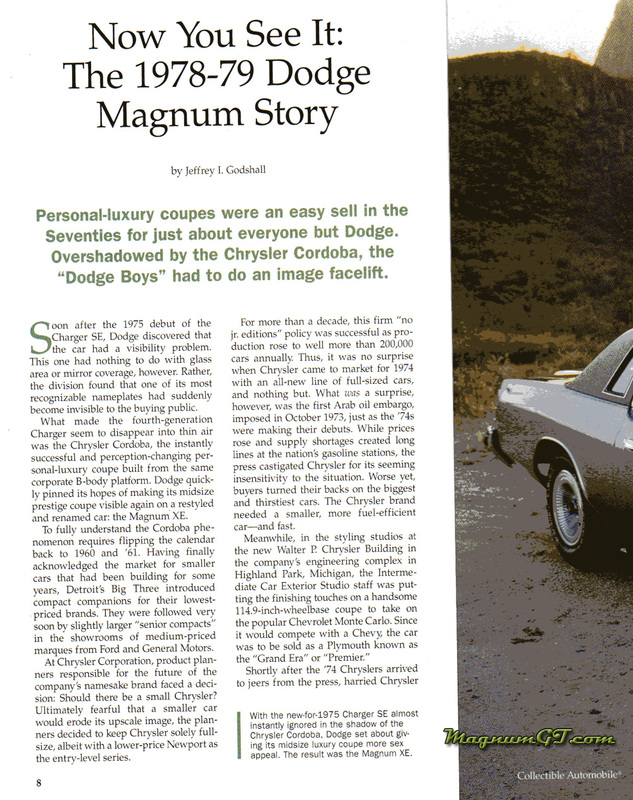 There was an excellent article on the 1978-1978 Dodge Magnums in the October 2013 Collectible Automobile. I strongly suggest all Magnum lovers purchase a copy of this magazine (used on eBay also available) before they run out. The below are page scans of the article — but you’re going to want to buy and save that issue. 1978 was a horrible year for the United States. 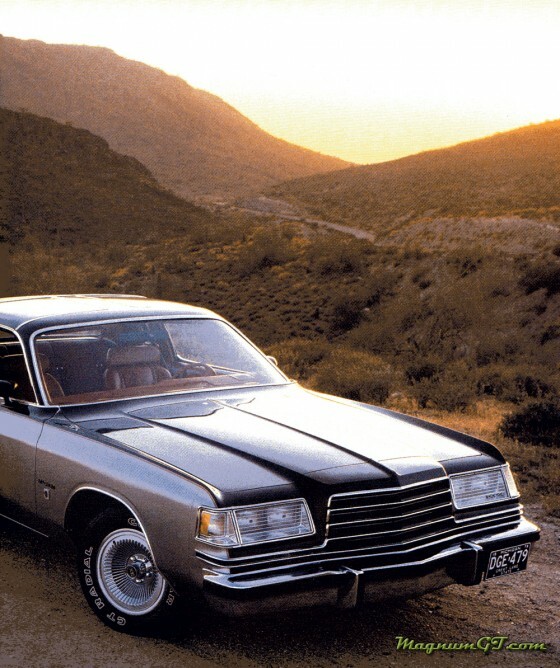 Jimmy Carter was President, Disco was at it’s height, and cars were both ugly and performance dogs. 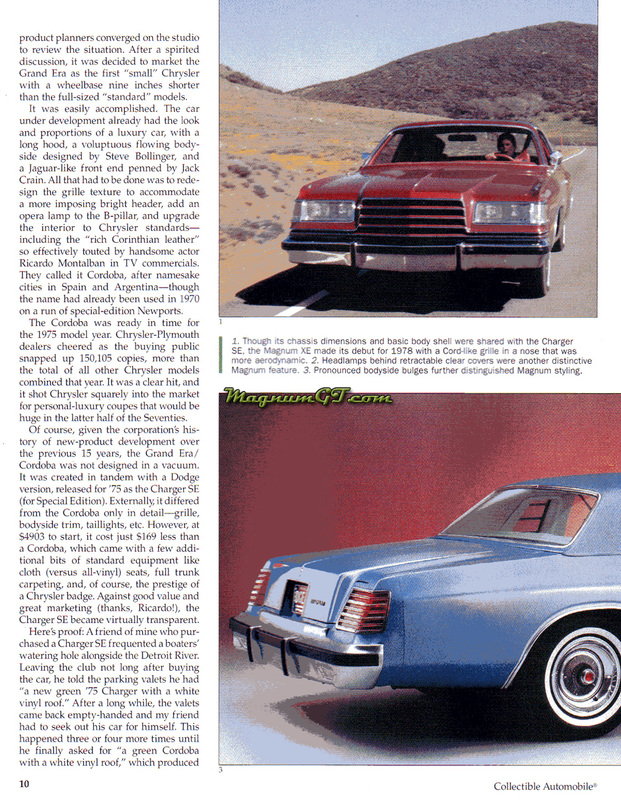 One of the few bright spots was the 1978 Dodge Magnum, which was to have replaced the Charger. 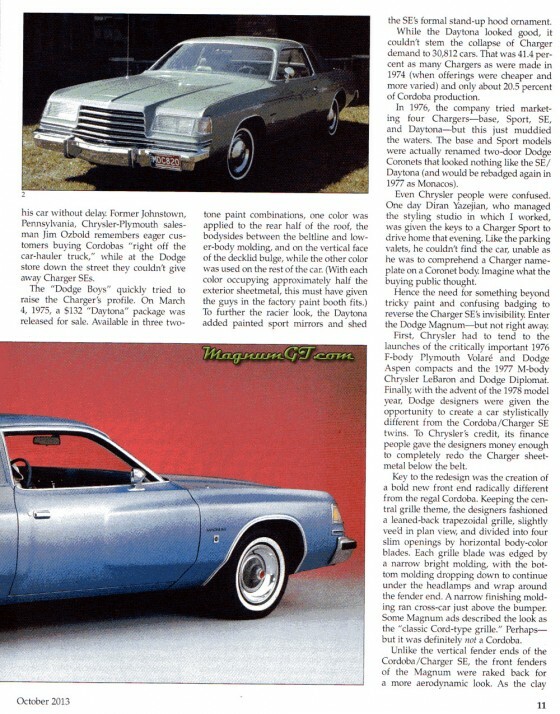 At the last minute Dodge executives got cold feet on the “Cord” style grill, renamed the car as the Magnum, and continued with the Charger for 78. 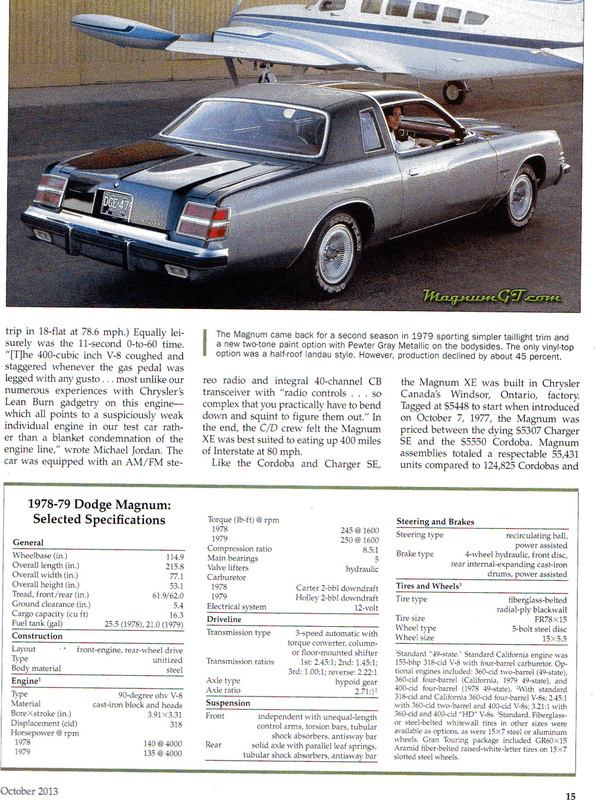 The Magnum was an immediate hit, the Charger was phased out, and the Magnum returned for 1979. The Gas Crisis in the Summer of 78 had automakers scramble to downsize, and the Magnum was replaced by a smaller Slant-6 Mirada for 1980. 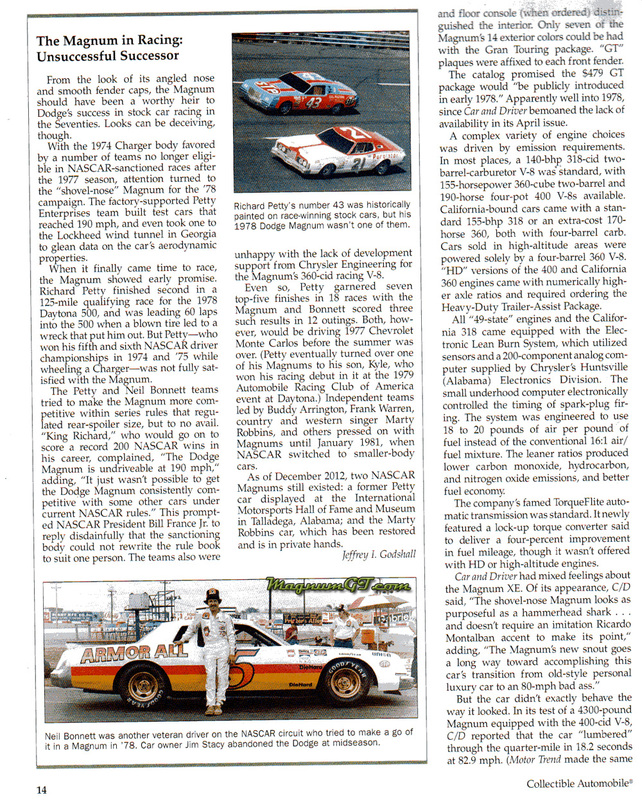 This site is dedicated to provide information for those interested in this single bright spot of the late 70s. Please feel free to browse through the pages and posting here, and follow us on Facebook. Originally designed to become the 1978 Charger, the radical frontal styling reminiscent of a Cord from the 30s scared Dodge’s management into hedging their bets and to continue the Charger while renaming the intended replacement the Magnum. The Magnum was an overwhelming success and the Charger was discontinued for 1979. 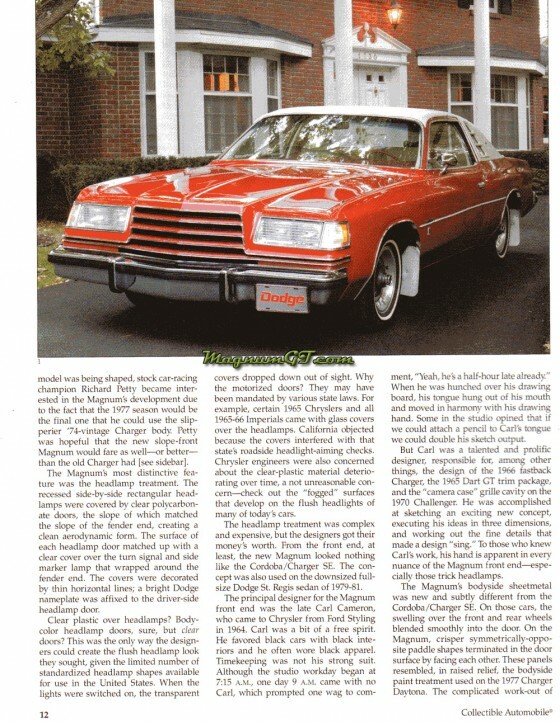 In 1979, Dodge also released a 4-Dr version on the new R Body platform called the St. Regis. However, the oil embargo and gas shortages caused Dodge to drop the B Body platform for 1980 — and the Magnum was replaced by the smaller J Body Mirada. DDS Enterprises, Inc. now provides the best advertising value on the Internet. The above is the mailer we send out to potential customers. Contact Dave for banner advertising for $1 a day. If you would like to learn more about the various Mopar Platforms that Chrysler, Dodge, Plymouth, and Eagle cars were based on — then use the below links to navigate to the various Body topics on www.MoparWiki.com. 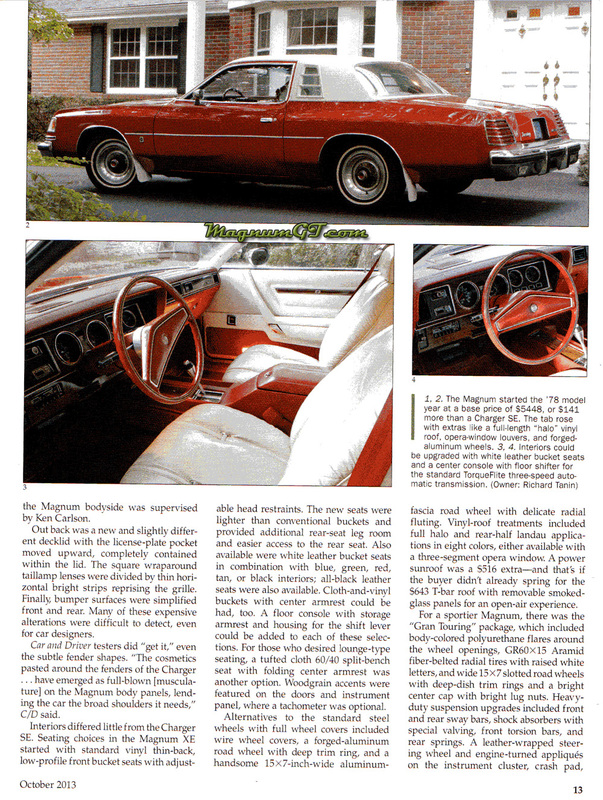 The MoparWiki has the ultimate goal of being the best reference for all things Mopar. This is done through collaboration of all willing to help improve the topics by adding information they have and citing a reference. Your help is welcomed. console, Cragar wheels, full 2+2 bubble top, 440 magnum engine with ram tubes.